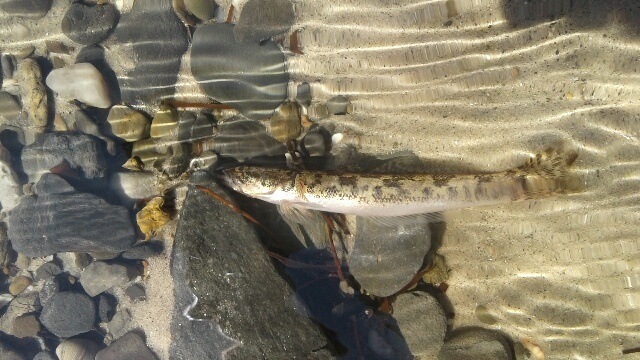 The small congolli that I found ‘belly up’ at Myponga Beach | Marine Life Society of South Australia Inc. I recently collected a small congolli that I found effectively ‘belly up’. Actually, it was lying on its side, on the shallow bottom towards one sandy rubbly bank of the moderately briskly outflowing but very narrow rivulet. The rivulet, barely 2 metres wide at that point, was running across the beach towards the sea, since the tide was out at the time. 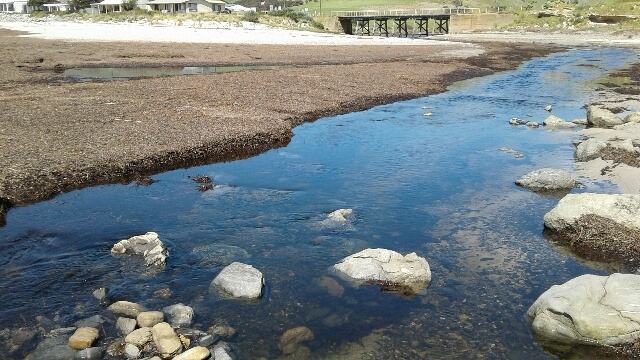 So, its water originated from the large but essentially stagnant pond of the Myponga River’s main estuary immediately inland of that quaint old single lane vehicular and pedestrian bridge (with its surface of rickety wooden planks making it resemble a jetty more than a road). The moribund fish was completely intact, it was not bloated, shrivelled or contorted, so it appeared freshly dead. If not dead, motionless anyway. On closer inspection, I could see occasional gasping mouth/gill actions. So, I’d found it, about to die, in the tepid, stinking, but still fairly clear-looking water of brackish estuary tidal outflow. 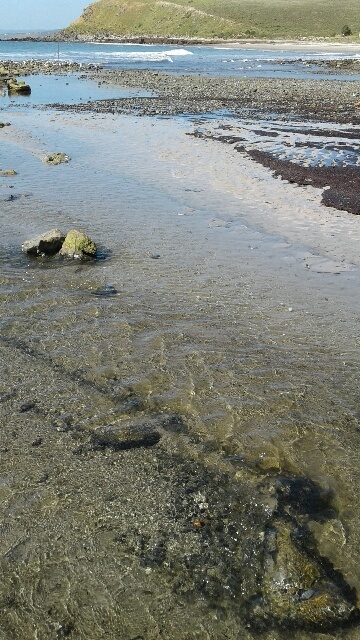 The shallow outflow was indeed quite clear looking, but the water was very smelly. 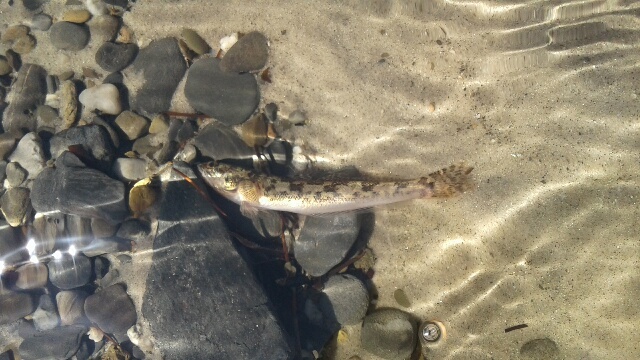 This lone fish (I saw no other congollis that day) was very near the beach at Myponga i.e. about half-way between the bridge and where the creek finally enters true seawater. As noted, the doomed fish was in deceptively clean-looking yet overtly putrid water from the estuary. That water was tepid to touch, smelled awful, and was presumably very hypoxic from excess eutrophication upstream and inadequate environmental flow allocations from the Myponga Dam itself. 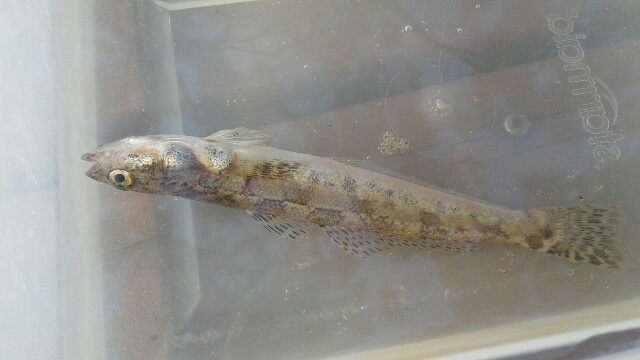 I phoned Fish Watch to activate my citizen science research permit before netting the congolli, and placing it in a small open-air tub of the same water I found it in, but it died very soon after that, as I fully expected, because it was clearly way beyond the point of no return when I first found it. This fish should not have died, and in my opinion, it would not have, if allowed anything approaching normal water quality at this location. I preserved the congolli in lab alcohol so that the tissue would at least remain potentially useful for the research team who’d included me on their permit application. When I first saw it, it looked dead but, when I picked it up by its tail, it wriggled frantically, but only managed half a second activity, then became motionless again. So, it was minutes from death when I found it. It had looked healthy enough apart from being nearly dead. I did not see any other fish at all in the same last bit of estuary flowing into the sea. A few very small (baby mullet or pilchard-type?) silver-lings were trying to swim upstream from the shallowest bits of clean true seawater around the estuary mouth but, in the 30-40 minutes that I watched, nothing actually ventured from the sea upstream into the putrid-smelling outflow channel. 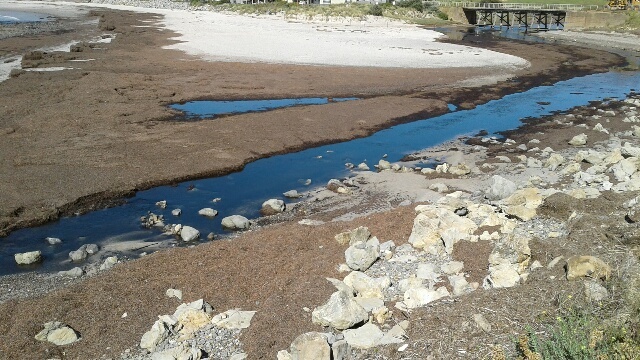 I was a bit surprised, because, as stated above, it was all quite clear looking, tea-coloured outflow which tasted salty (very brackish, not even close to fresh) when I did the wet fingertip ‘taste then spit’ test in a few spots between the sea and the bridge. The water looked clear, even upstream of the road bridge too, but very smelly everywhere except the sea itself. Interestingly, the immature congolli was easily visible with its white belly shining in the sun in a few inches depth over pale yellowish-brown silty sand, yet it had not been eaten, or even pecked at, by the gulls, etc.., which mainly milled around in the bay i.e. swimming in groups about 50m off the beach where dead weed was floating. It would’ve been a tasty snack usually. So, I am fairly confident it was not just overcome by low oxygen levels in the very warm water (warm from the daytime sun, and maybe other contributors, including exothermic biological fomentation upstream) on the main wide shallow upstream section of the estuary inland from the bridge. This despite a quite brisk flow towards the sea as the tide ebbed (air temperature by then was only 16°C according to my car thermometer). For seabirds to ignore it suggests (but does not prove) it was probably toxic and would have a bad taste for seagulls (toxic algae or whatever…. just guessing). I kept a small sample of the creek water it was in just in case SA Water wanted to analyse it (a precaution only). Given that we drink the Myponga Dam water, they’d maybe want to be sure that the congolli was only sick from downstream issues. Yes, the good work done on the Myponga estuary in 2007seems to have been buried and ignored. This is the peak time for Congolli and it is a great shame that environmental flows have not been established as part of reservoir management. If the water was clear and smelly, I would suspect a sulfur issue. The smell of sulfur can vary from the classic rotten egg gas to a fairly sharp odour, depending on its oxidisation state. If it was clear and a sweet smell, I would expect an acid issue. Beyond ‘clear’, there are also tonal differances with various water quality issues… There is a colour chart in the waterwatch estuarine manual. Either issue will badly damage fish gills, resulting in them often lying on their sides and dying, regardless of improved water quality. Fish first aid tip – take a bottle of the water they are in and shake it like crazy. Beyond giving you an opportunity to really smell the water as many of the compounds off-gas (being careful not to damage your own lungs), this water will then be oxygen saturated but will be of no shock to the fish otherwise.